The season of Advent always has four Sundays. However, it does not always have four Wednesdays. This year we have only three Wednesdays. Tomorrow (12/5) we will have our first Wednesday Advent service. We will be using Evening Prayer for our liturgy. This is a short, non-chanting service. In The Lutheran Hymnal, it was called “sufferages.” We will be singing three hymns: “The Advent of Our King” (LSB 331); “Entrust Your Days and Burdens” (LSB 754); and “Arise, O Christian People” (LSB 354). The tunes are all known by the congregation. 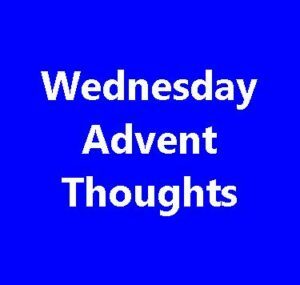 In our tradition, there are no assigned lectionary readings for the Wednesdays of Advent. Ministers are left to structure the readings as they see fit. This year I have chosen to structure our thoughts around Christmas and Advent traditions. The three traditions we will consider are Advent Calendars (12/5); the Christmas Crèche (12/12); and the Christmas Tree (12/19). Below are the readings we will be using for tomorrow, and a few thoughts that didn’t make the homily. 14 And God said, “Let there be lights in the expanse of the heavens to separate the day from the night. And let them be for signs and for seasons, and for days and years, 15and let them be lights in the expanse of the heavens to give light upon the earth.” And it was so. 16And God made the two great lights—the greater light to rule the day and the lesser light to rule the night—and the stars. 17And God set them in the expanse of the heavens to give light on the earth, 18to rule over the day and over the night, and to separate the light from the darkness. And God saw that it was good. 19And there was evening and there was morning, the fourth day. Thoughts: This is, obviously, part of the creation account. We are reminded that God created the most amazing things that we can see. As their creator, He is also their Lord, their owner. However, the main purpose of these amazing creations is for humanity. They help shape our days and years. They also provide help in navigation, so that we can do our part in fulfilling the Great Commission. I might also add that as we learn more about space and what is out there, the more we can appreciate just what a special and unique place the earth is. Certainly this little blue ball hung in space cannot be a random, unplanned, accident. Thoughts: David was going through some tough times when he wrote this Psalm. So his enemies are taunting him and he is even reduced to tears. During this troubling time he remembers better days, days when he was in worship services with his fellow believers. These memories strengthen him. They help him understand that better days are ahead. They help him remember that God is with him, even when it doesn’t seem like it. I can’t tell you how many times an individual or a couple has come to the church office over the years with problems. They haven’t been to a worship service in years, maybe not since they were children. They are hoping I can, in an hour or two, pour into their lives years of attendance at Sunday morning worship. They may not realize it, but that is what they want. As you sit in worship services Sunday after Sunday, you may think, “I’ve heard this before,” “I’ve sung this before,” and so on. You are probably right. But that is often the point. These are the foundation blocks on which we stand when life hits us in the face. We want to keep our footing strong. If it is neglected, we can begin to loose our footing and not even know it. When the trials of life hit, we want to be standing firmly on the solid rock foundation of Jesus, like David did. 16 Therefore let no one pass judgment on you in questions of food and drink, or with regard to a festival or a new moon or a Sabbath. 17These are a shadow of the things to come, but the substance belongs to Christ. 18Let no one disqualify you, insisting on asceticism and worship of angels, going on in detail about visions, puffed up without reason by his sensuous mind, 19and not holding fast to the Head, from whom the whole body, nourished and knit together through its joints and ligaments, grows with a growth that is from God. Thoughts: There was, in Paul’s day, a group of believers who failed to understand the meaning and purpose of the ceremonial law in the Old Testament. (To be honest, this is true today as well.) The ceremonial law was established, primarily, as pointers to Jesus. It reminded us of our sinfulness and the need for Jesus to come as our redeemer. This group of believers wanted to hold onto the ceremonial law as a necessity of the Christian Faith. Such a misuse of the ceremonial law can actually separate us from the grace of God in Christ Jesus. Paul branches out to other things that can, inadvertently, separate us from Christ. We are to hold onto Christ, not human ideas of wisdom. Again, the value of regular, Christ-centered, biblical, worship comes to my mind. 41 Now his parents went to Jerusalem every year at the Feast of the Passover. 42And when he was twelve years old, they went up according to custom. 43And when the feast was ended, as they were returning, the boy Jesus stayed behind in Jerusalem. His parents did not know it, 44but supposing him to be in the group they went a day’s journey, but then they began to search for him among their relatives and acquaintances, 45and when they did not find him, they returned to Jerusalem, searching for him. 46After three days they found him in the temple, sitting among the teachers, listening to them and asking them questions. 47And all who heard him were amazed at his understanding and his answers. 48And when his parents saw him, they were astonished. And his mother said to him, “Son, why have you treated us so? Behold, your father and I have been searching for you in great distress.” 49And he said to them, “Why were you looking for me? Did you not know that I must be in my Father’s house?” 50And they did not understand the saying that he spoke to them. 51And he went down with them and came to Nazareth and was submissive to them. And his mother treasured up all these things in her heart. Thoughts: This is the only story we have in the Bible about Jesus following the nativity stories and before he begins his public ministry. In it we discover that Jesus was aware of who he was as he grew up. One of the great mysteries about our Lord is that he is both fully human and fully divine. This was not something the Church dreamed up. Even as a youth, he taught this to his parents (though they “should” have known because of the circumstances surrounding the birth of Jesus). In the last verse, we are told that Mary “treasured” these things in her heart. That word “treasured” means that she pondered them often. She might have been making dinner or doing the laundry, and Jesus would be on her mind. This is a good model for all of us. As we gather, either on Sundays or Wednesdays, we want to keep Jesus on our minds. I might also point out the importance of worship in the routine of the Holy Family, as seen in this reading. May this help us prepare for our first Wednesday Advent service.